The history of Lucy’s pulling the football away from Charlie Brown in Peanuts. All Your Life, Charlie Brown. All Your Life. The complete history of Lucy’s pulling the football away. Everyone has their favorite telltale signs of the approaching autumn: Mother Nature maxing out the hue and saturation sliders on her favorite arboreal subjects. The chill in the air that makes cardigans strain for the attention of their mustachioed owners. The unfortunate intrusion of pumpkin flavoring into our daily beverages. On the comics pages for years, one sign of fall loomed above all others. I’m speaking, of course, of the annual Saga of the Swipe: Lucy, Charlie Brown, and that infernal football. This sacred autumnal drama, repeated nearly every September or October for over 50 years, has become our collectively-acknowledged paradigm for the uneasy tension between trust and betrayal, hope and despair. To a kid, of course, it was the moment of failure that mattered—not the metaphor. No single act better encapsulated a child’s feeling of powerlessness, and I felt Charlie Brown’s frustration and disappointment with every bone in my body. As the years went by, Lucy’s seemingly compulsive need to torment poor Charlie began to gnaw at me. I started to wonder—what drove Lucy to unrepentantly torture Charlie Brown in this fashion, year after year? It’s true that Charlie Brown’s fail epic is in keeping with Charles Schulz’s darker sensibilities (when asked why he never let Charlie kick the football, he famously replied, “You can’t create humor out of happiness“). But I wanted something more—an answer from the characters themselves. Fortunately, every strip Schulz ever drew is compiled in a multivolume Peanuts collection, and there’s even a Peanuts wiki, so I began at the beginning, hunting for and examining each football comic in seriatim, from the 1950s onward, to see if a larger pattern might emerge from Schulz’s kick chronicles. What I discovered was a surprisingly complex story told over decades, with twists, turns, and evolving character motivations that are far richer than might appear from a yearly glance at the funny pages. Lucy herself has offered a myriad of justifications over the years for snatching defeat from the jaws of victory: physiological (1966: a “ten-billion-to-one” muscle spasm), Ecclesiastical (1980: “To everything there is a season … and a time to pull away the football”), psychological (1975: “I’m not your mother, Charlie Brown”), sociological (1971: “This year’s football was pulled away from you through the courtesy of women’s lib”), and philosophical (1974: “In every program, Charlie Brown, there are always a few last-minute changes”). In a meta-moment, Lucy even points to the larger meaning of this annual act: “Symbolism, Charlie Brown! The ball! The desire! The triumph! It’s all there!” (1996). This echoes a dialogue they had 10 years earlier (Charlie Brown: “Somehow, I’ve missed the symbolism.” Lucy: “You also missed the ball, Charlie Brown”). But why did Lucy start yanking the football away in the first place? It’s true that the first time Lucy pulls the football away from Charlie Brown, it’s an innocent gesture—she simply doesn’t want Charlie Brown’s dirty shoes to mar her brand new football. In fact, in the same strip, Lucy even lets Charlie Brown try again, without pulling away the ball. (Charlie Brown trips over the ball anyway, of course.) But just a few years later, in 1953, is the true origin story for Lucy’s sadistic game. 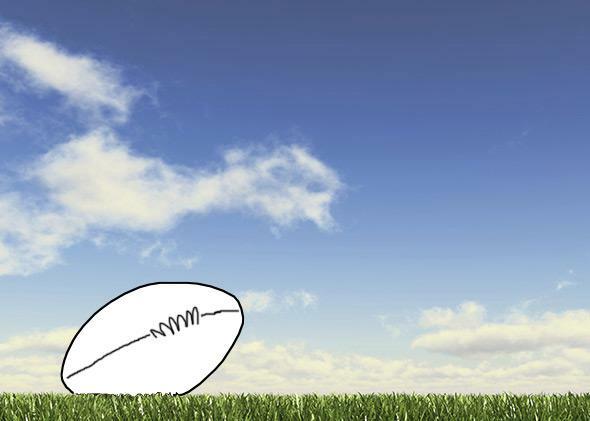 In this pivotal strip, Lucy herself struggles to kick a football. Over and over she tries to punt the ball and flubs her kicks. And what does Charlie Brown do? He publicly and cruelly mocks her. Charlie Brown: You’re hopeless! That was the worst kick I’ve ever seen! Charlie Brown: Little girls don’t belong on football fields! Go home! Charlie Brown: Well, don’t stand around here! GO ON HOME!! Get out of here! 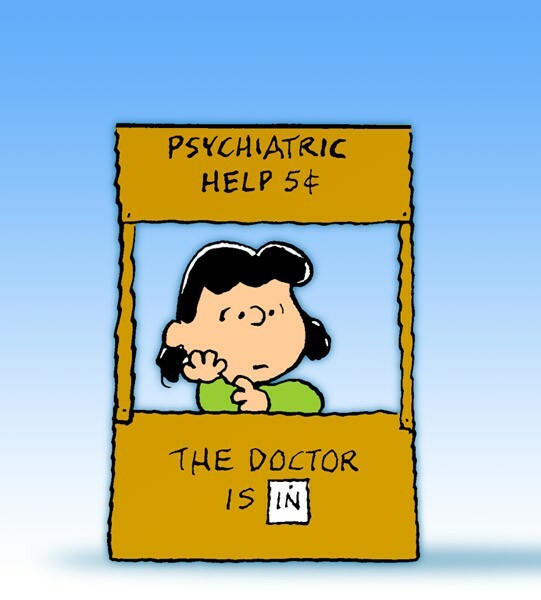 Is there any wonder why Lucy would choose to embarrass Charlie Brown with a football year after year? Her humiliation at the hands of Chuck was a formative experience in the young girl’s life. But the story goes even deeper. Twice in the week before this early football-themed comic appeared, Schulz ran strips that featured Charlie Brown failing to kick the football all on his own. First, he simply misses the ball, and a few days later, in a darkly existential moment, we see a forlorn Charlie Brown dwarfed by the gigantic goal posts under which his kick has fallen pathetically short. A week later, in the pivotal comic quoted above, Charlie Brown transfers his feelings of im-punt-ence by lashing out at poor little Lucy. Once we view Lucy and Charlie Brown’s autumnal tango in light of this poignant origin story—a cycle of pain and humiliation endured and transmitted—their annual football rite takes on a darker edge, and Lucy’s quips have the biting, sardonic twinge of someone who is not just out for fun, but for revenge. 1961: “Don’t you trust anyone any more?” 1963: “A woman’s handshake is not legally binding.” 1969: “Never listen to a woman’s tears, Charlie Brown.” And, in a shockingly dark strip from 1970, Lucy recites and interprets a long, withering passage from Isaiah: “How long [will you fail at this]? ALL YOUR LIFE, Charlie Brown, all your life!” As this series progresses, Lucy is no longer simply the trickster—she is an injustice keeper, nurturing her anger until it turns into something far more consuming than the original offense. But then, in the late 1970s, the series turned a corner. In an uncharacteristically sober moment for the strip, there appeared a sequence of strips where Charlie Brown took seriously ill. When Lucy hears that Charlie Brown’s return from the hospital is uncertain, she breaks down, realizes how much he means to her, and promises that she’ll let him kick the ball, if only he’ll get better. Then, in August of 1979, upon Charlie Brown’s recovery, Lucy does something that she had not done since he first exiled her from the football field as a toddler—she lets him kick the football. Of course, Charlie Brown being Charlie Brown, he misses the ball anyway (and Lucy gets karmic retribution for all those years of trickery in the form of a broken arm), but the cathartic moment is Lucy’s holding of the football, not the unsuccessful kick that inevitably follows. Interestingly, in the ensuing years, Lucy went back to her old tricks, yanking the football away every fall. Set in her ways, Lucy can’t change her behavior after 50 years, but the near loss of her bald-headed sparring partner served as a catalyst for her own personal “reboot” from teaser to teacher. Lucy now yanks the ball away not out of malice, but with a sly, loving intention. Her post-swipe comments in more recent strips range from the wistful (1986: “You look forward all year to a special moment, and before you know it, it’s over”) to the inspirational (1989: “Think how the years go by, Charlie Brown … think of the regrets you’ll have if you never risk anything …”). Acting with a nickel’s worth of hard-won wisdom, Lucy now wields the football like a Zen master with a keisaku (awakening stick). After all these years, Lucy deals the stinging blow of failure each fall in order to recalibrate Charlie Brown’s focal point, and to drive home the lesson that Schulz may well have meant all along: It’s not the football that matters, Chuck, it’s us!